The Blackfoot Shirts Conference was held at the Pitt-Rivers Museum, Oxford, 30-31 March 2011.This project explored ways in which close access to heritage objects strengthens indigenous identity and culture. The purpose of the conference was to share what had been learned and to bring Blackfoot community representatives and UK museum representatives together. RAMM delivered a presentation to show what Blackfoot material was held at the museum in Exeter. It was felt that virtual information about this collection would be of value to visitors. This is particularly so with the Blackfoot Nation, who want to learn more about museum collections and the Blackfoot material held in their care. When the Museum acquired these items from Cecil Denny and Edgar Dewdney, they became part of the permanent gallery. 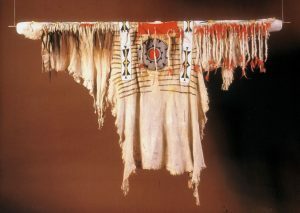 Crowfoot’s regalia is quite fragile and is therefore carefully stored for most of the year. It is displayed in the context of discussions relating to Blackfoot culture, the signing of Treaty 7 and to stories relating Cecil Denny and Edgar Dewdney. However, what is clearly needed is appropriate interpretation that accurately reflects the voices of the Blackfoot people.